Always had Scottoilers on my bikes but only the V system upto now . Didn't want to interfere with the vacuum pipe on my Tiger 800 and I don't care for the handlebar control on the E system so that left the X system . Thought £200 was a bit salty tho' . Fitted it this morning hopefully try it out tomorrow . Decent system, does what its meant to do. Is it worth 200 quid, no its not. The fit and finish could be improved but it really is a minor gripe. its not bulky with no bulky controller upfront like the Esystem which is mainly why I got it over the Esystem. Comes with pretty much everything you need, I would purchase the no screw sticky pads from somewhere as the sticky pads that come on the back of the clips don't stick to anything so glad I had some spare stick pads to put on the back of the clips! 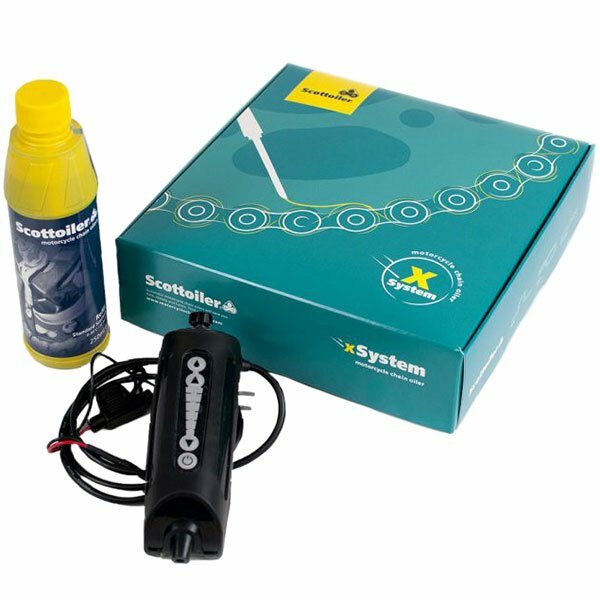 Had cause to contact Scottoiler during fitting and for some setting up advice and they were ace replied quickly and with detailed answers and took my feedback on board. Fitted to a Tracer 900 GT under the front seat. Very easy installation and the new stick on clips and mounting seem to be very good. The adjustment is easy and I think its going to be a fit and forget device other than topping up with oil. Have not done enough miles to comment on chain life but it is certainly doing its job. Easy to fit and easy to use on a 2016 Triumph Tiger 800 XRx. The hose fed through the swing arm easy enough with a stiffener attached. The dispensing end bolted nicely to the swing arm. The main body strapped on to the frame adjacent to the exhaust. The wiring was a little bit fiddly when fitting to the positive end of the battery as I had to cut a slit in the terminal cover for the cable to fit in nicely. Purging the system was quick. Now playing with dispensing settings to find optimum for my riding which is every day throughout the year.